A spaceborne lidar instrument that fired more laser pulses than any previous orbiting instrument has ended its operations on the International Space Station, after a successful 33-month mission to measure clouds and tiny atmospheric particles that play key roles in Earth's climate and weather. 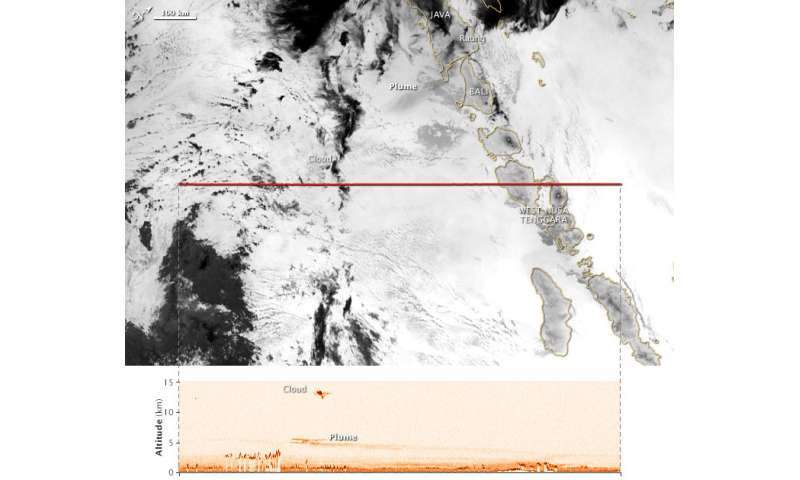 During its mission, NASA's Cloud-Aerosol Transport System (CATS) lidar provided measurements of the vertical structure of clouds and aerosols, including volcanic eruptions, man-made pollution in China and India, smoke from wildfires in North America and dust storms in the Middle East. The CATS data products are freely available to the science community and have already been cited in numerous research studies as well as at national and international scientific conferences. The CATS measurements enabled more accurate aerosol modeling and forecasting and improved tracking and forecasting of volcanic plumes and associated costly aviation hazards. It also advanced our understanding of aerosol proximity to clouds, which is critically important to predicting the effects of cloud-aerosol interaction on the Earth's climate system. CATS was funded by the International Space Station Program to advance the use of the orbiting laboratory as a platform for Earth science research. CATS helped pave the way for future low-cost missions to the station and advanced laser technology designed to measure clouds and aerosols. "The CATS project was a spectacular opportunity to provide first-of-its-kind science from the space station. CATS was an amazing combination of enterprising science pathfinder, technology demonstration and programmatic forcing function," said Matt McGill, CATS principal investigator at NASA's Goddard Space Flight Center, Greenbelt, Maryland. "The CATS payload operated for more than 200 billion laser pulses - an unprecedented achievement for a spaceborne lidar." Launched on Jan. 10, 2015, CATS was designed to operate at least six months, but lasted five times its life expectancy. On Oct. 30, 2017, the onboard power and data system stopped working and could not be resuscitated. The station orbit was valuable for gathering a diverse and important set of cloud and aerosol observations. The CATS instrument was able to observe the same locations at different times of day, allowing scientists to study day-to-night changes in cloud and aerosol effects from space. The instrument was also the first space-based lidar to provide cloud and aerosol data to users in near real time - less than six hours - allowing for more accurate computer models and forecasting of dust storms, fires and volcanic eruptions. The project was also unique because of its rapid construction, small budget and placement on the space station. Unlike larger missions, the experiment had a small team, limited budget and shorter timeline - only two years - to be built for the station. The mission helped refine and streamline the process for putting future NASA payloads on the station. "CATS provided the opportunity to utilize a small team and streamlined process to highlight that it is possible to build and deliver a low-cost instrument that still provides critical, cutting-edge science measurements," said McGill.